Welcome! 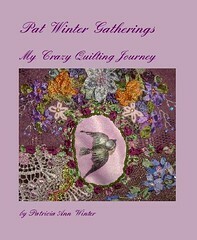 A special thanks to my friend Nickilee who first introduced me to Crazy Quilting. If it wasn't for her I would still be making traditional style quilted wallhangings. As a member of the HGTV Quilting and Needlework forum I also want to thank all the ladies for preparing the lessons for our current Crazy Quilt project. To all you blogging CQ'ers thank you for introducing me to your world of Crazy Quilts. I have enjoyed viewing your creative works and inspirations. Now I hope to share my love of needlework with you. Welcome...you will be addicted very soon!!! :-) Lovely work. I agree with Pat! Welcome...and it is a fabulous, supportive, and wonderful addiction. Your work is lovely and should be shared. I'm thrilled to be trading with you too! I'm so glad that you have a blog. So we may be able to see your wonderful works more easily.